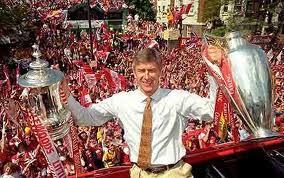 Arsene Wenger is probably the greatest manger in Arsenal history. Under his reign Arsenal have become one of the biggest football clubs in the world. He’s the most admirable exponent of beautiful football and a master at developing uniquely talented players. But apparently we should chase him from our club for having the audacity not to win a major trophy for a few years. He had the arrogance to think he could keep his job merely by guiding Arsenal to seasons of continued competitiveness while treating the fans to entertainment that few clubs can offer. And he did all that while the club moved stadiums and attempted to survive under a mountain of debt during a global recession. How dare He?! Three seasons ago Arsenal finished fourth. Last season Arsenal finished third. This season we look headed for a second place finish. So it’s sensible to suggest that the team are making progress and improving versus their domestic rivals. We’ve continued to qualify for the Champions League every season and consistently progressed to the knockout rounds. During that time, Liverpool have done quite the opposite. They are a massive club that was once the biggest in England and one of the biggest in the world. But poor decisions in the transfer market, combined with poor management has seen them slip out of the Champions League places and far from title contention. And with big spending rivals ahead of them, there’s no guarantee they’ll return to the top any time soon. Moreover, there’s no guarantee that Kenny Dalglish is the long term solution as manager and Liverpool could be headed for a prolonged period of uncertain leadership. Look at Chelsea. They have infinite resources. In Carlo Ancelotti’s first season they won the domestic double and started the current domestic campaign in championship form. But by December the home crowd was booing them off the pitch and Ancelotti’s reign looked certain to end. So what did Chelsea do? they did what Arsenal were encouraged to do; they dived into the transfer market. Yes, they seem to have bought a big talent in David Luiz. But Chelsea also spent £50 million on Fernando Torres and he appears to be incapable of scoring a goal for them. Chelsea spent the money, and yet they languish behind Arsenal in the table, fresh off a disappointing draw with Stoke City. If Arsenal fans are feeling mutinous over a disappointing second place finish, imagine what it must feel like to spend all that money and finish behind parsimonious Arsenal. Arsenal continue to compete at a high level without the ability to spend like many of their rivals. This season we’ve already shown we can play Chelsea and Manchester City off the pitch despite the disparity in financial resources. And what if Arsenal had dived into the transfer market in January? Would that have made the difference? Fans were calling for a backup center-back or another defensive midfielder. If Wenger had spent 40 million in January on top quality players at those positions, would it have effected the result on Saturday? Not likely. On Saturday, Arsenal were let down by world class players failing to score. Not something many fans would’ve suggested we needed to address in January. Wenger has proven he will spend money in the transfer market, but for some reason he’s not given any credit for that spending. Vermaelen was a fantastic buy, but he’s been injured. Chamakh has struggled as the season has worn on, but he kept our season alive for the first few months. Wenger set an Arsenal record when he signed Andrey Arshavin but that money wouldn’t even buy half of an Andy Carroll these days. And Laurent Koscielny has proven he can be a top quality defender. Yes, Wenger gets it wrong, like he did with Silvestre and arguably Squillaci, but those errors aren’t Torres sized. The fact is, Arsenal can’t afford to make a £50 million mistake like Chelsea can. When Wenger spends, he has to choose wisely and get it right. If he spends big, then he has to see a return on that investment. Liverpool are a perfect example of what happens when signings don’t pan out. Look at Babel, Aquilani and Keane to name just a few. We might be frustrated that Wenger didn’t sign a goal-keeper, but could he have signed anyone quite as talented as Szczensy? If he had signed Schwarzer, would we be any better off right now? And would Szczesny have been willing to re-sign with Arsenal, or would we have lost him too? Not so easy being Arsenal manager. Can you think of another manager who commands as much respect from his players as Arsene? Playing for Barcelona is Cesc’s dream, yet he kept quiet this summer, behaved professionally, and stayed with Arsenal, in part, out of loyalty to Arsene. Compare that with Wayne Rooney’s antics in the middle of the season. The Cesc situation was tricky. It required sophistication to manage the interests of the team, the player and the fans. Ultimately it’s hard to argue with the way Arsene managed that situation. Nasri, RVP, Theo, Cesc, Song, Wilshere, Clichy, Vermaelen, Djourou, Sagna and Szczesny. We might not have that exact eleven, but we’d potentially also have Arshavin, Ramsey, Bendtner, Chamakh, Lansbury, Frimpong, Coquelin, Koscielny, Gibbs, etc. There’s experienced talent in that side, and young talent still developing. And that’s thanks to Wenger. He may not have the balance perfectly correct at the moment, but he’s got a team ready to compete on all fronts that cost less to assemble than Chelsea’s January transfer budget for 2 players. And for anyone who doubts that Arsene Wenger gets the best out of his players, just look what happens when they leave Arsenal. Someone remind me which league Alex Hleb is dominating at the moment. Or Matthew Flamini. Emmanuel Adebayor isn’t setting any scoring records these days either. Kolo Toure is banned and William Gallas is a Spud. I think there’s a general feeling that the manager broke up the invincibles too quickly, but none of those players went to have dominating performances at their subsequent clubs. And I genuinely believe that Wenger recognized the need to begin building the next generation. Had he hung on to the invincibles too long, his young players might have left and the decline could have been swift and severe. There’s simply no denying that Wenger has assembled an incredibly talented side. We can moan all we like about this team failing to win trophies, but Wenger’s job as manager is to build the best team he can. Nasri, Theo, RVP, Bendtner, Arshavin, Song, Wilshere, Rosicky, Vermaelen, Djourou, and Sagna are all full internationals who usually start for their respective nations. Cesc, Clichy, Koscielny, Fabianski, Szczesny, Diaby, are also full internationals. There’s no denying the talent. And while there’s also no denying that something is holding these players back from winning when it really matters, a manager can only be held responsible for so much. He can find the talent. He can train the players. He can implement the strategy. But he can’t look inside their hearts and see what’s inside. At some point don’t the players bear some responsibility for their results? I’d say so. Could Wenger spend more than he does? Yes. Would it guarantee better results? No. Had Wenger bought another DM or creative midfielder in the summer, and sent Wilshere out on loan, would that have been preferable? Not likely. While it’s true that Wenger’s reluctance to spend is frustrating, it’s absurd to think that Arsenal can legitimately compete in the transfer market for any player that might be a target for City, Chelsea, United, Madrid, Barca, etc. So that means we are left to unearth gems like Vermaelen or simply resign ourselves to buying second tier talent. And buying second tier talent is likely to get you second tier results. It’s also likely to drive your best players out of the club. Why would Jack Wilshere want to sit on the bench behind a second-rate midfielder? Why would Szczesny want to sit on the bench behind Schwarzer? They wouldn’t. Look at the teams that qualify for the Champions League from the major leagues and you’ll see names like Real Madrid, Barcelona, Inter Milan, AC Milan, Bayern Munich, Chelsea, Manchester United and Arsenal. We are now firmly established in that group. And we are there because of Arsene Wenger. Manchester City, with their limitless resources, will get there eventually. Liverpool may someday return to that group. But Arsenal can count themselves part of Europe’s elite thanks to a masterful manager. Part of the decision to part company with Arsene Wenger is determining who will replace him. In my mind, there’s no one on the planet who can do what he does. There’s a hugely talented group of players at Arsenal right now. And while it’s hard to see at the moment, they’re making progress. There will be titles in the future, but only if they are lead by Arsene Wenger. It’s hard to be patient as fans, but we have to remember how good we have it. I don’t want to be writing a blog in five years, when we sit mid-table, talking about how we shouldn’t have been so ungrateful for what we had under Arsene. If we continue to trust in Arsene, he will produce results. He always has.